President Maithripala Sirisena was candid and open minded during an interview with the Daily Mirror two days before the 66th Anniversary Celebration of the SLFP, scheduled for September 3 (tomorrow) at Campbell Park, Borella. President Sirisena discussed a range of issues from giving him the party leadership, the world’s view on Sri Lanka after the establishment of the ‘Yahapalana Government’ and domestic issues faced by the SLFP and the Unity Government. Since he won the Presidential Elections in 2015, President Maithripala Sirisena was unanimously elected as the SLFP President. The first major SLFP public rally was held under his leadership at Hyde Park on May 13. Only a few party leaders attended that rally because some people harboured certain misconceptions about him. The 64th Annual Convention of the SLFP was held in Polonnaruwa on September 2, 2015. It was a fairly successful rally with the participation of about 15,000 SLFP members and party supporters. The convention was also attended by former President Mahinda Rajapaksa. The 2016 May Day rally was held at Galle and was a huge success. It was attended by more than 100,000 people. The 64th Party Convention held in Kurunegala was also a big success. There was considerable participation by party supporters from the North East for the convention in Kurunegala. The SLFP May Day rally held in Kandy this year was a major success despite heavy rains. People came in four processions. Now, the SLFP has decided to organized a huge rally at Campbell Park, Borella which would also be an opportunity to show the strength of the party. The participants are expected to comprise top leaders from all nine provinces, 165 constituents, towns, Pradeshiya Sabhas and also supporters from the grassroots. The SLFP expects to extend invitations to all past and present leaders of the party, constituent partners of the UPFA and all political parties represented in Parliament to attend the convention. The theme of the 66th SLFP convention is ‘A clean political campaign for the future of the nation’. A number of committees have been appointed to ensure that the event turns out to be a success. The party leadership are expected to declare the Future Programme and how the SLFP expects to form a Government on its own in 2020. Commenting on the performance of the Yahapalana Government during the past two years, President Sirisena said it is quite obvious that the people have been thoroughly disappointed and disenchanted due to party politics. Though Governments have changed the authorities taking over power have failed to establish a system where politicians and public officials don’t engage in corruption, embezzling and money laundering. Such practices have gone unchallenged during the past decade, in particular. But President Sirisena affirmed that people mustn’t forget that there are honest politicians and officials and those immersed in financial and other crimes don’t form the majority. The shady and nefarious acts of this small group, which includes politicians from the Pradeshiya Sabhas to those in Parliament, have distanced them from voters. People have lost their confidence in such politicians. But the President said that he would never forget the fact that 6.2 million people voted him in to power on January 8, 2015. People voted for him to put an end to the oligarchy that oppressed the entire nation. The voters also wanted democratic rule restored in the country and the President said that he had done that. He went on to state that as the common candidate at the 2015 Presidential polls he had given a pledge that a corruption free administration devoid of nepotism and dictatorship would be established. But the president said that he had realized that it isn’t an easy task. This is because the same set of politicians and officials have returned to form the establishment. He said that this is why he keeps making a fervent appeal to all right thinking and corruption free politicians to rally round the SLFP and help establish a clean and unblemished administration. These are his thoughts during a time when the SLFP is about to have its 66th convention. The President said he believed the people of this country can begin a new journey and have a clear political ideology. But he said that it would be possible only with the blessings and the cooperation of everyone. Though the ‘Yahapalana Government’ hasn’t been fully successful it has given hope to all Sri Lankans that the Government is on the right track to remove the seeds of evil planted by the previous regime. No one can deny the fact that the Yahapalana Government has restored democracy, rule of law, media freedom and judicial independence. We have no enemies in the global community. the entire international community respects and is friendly with Sri Lanka. By the time he went to the Sri Lanka Foundation where discussions were held, the SLFP Central Committee had unanimously endorsed his appointment as the party leader. Former Presidents Mahinda Rajapaksa and Chandrika Kumaratunga had been appointed as patrons while former Prime Ministers Ratnasiri Wickramanayaka and D.M.Jayaratna were named as party advisors. The 64th anniversary of the SLFP was held in Polonnaruwa in 2015. It was a fairly successful rally with the participation of about 15,000 SLFP members and party supporters together with former President Mahinda Rajapaksa. The UNHRC in March this year gave Sri Lanka time until September 2019 to address the issue regarding war crimes allegedly committed at the tail-end of the war. Commenting on how the party leadership was entrusted upon him by ex-President Mahinda Rajapaksa, he reminded everybody that he is still the party leader of the SLFP. President Sirisena said that Rajapaksa offered him the SLFP leadership (party president) on a platter. He said that he never request for this post. This happened on January 15th in 2015 following a discussion at the residence of former Speaker Chamal Rajapaksa. This is no secret to the whole country. The president said that following the acceptance of the party leadership, he had told the SLFP loyalists, party membership and the people of the country that he had taken the decision to accept this post because he disliked to see the party being divided. He said that in taking this decision the experience of serving the part for over 50 years in various capacities had been helpful. He recalled that that when Rajapaksa had asked him whether he would wish to accept the party leadership he had answered in the affirmative. “By the time I went to the Sri Lanka Foundation, where discussions were held, the SLFP Central Committee had unanimously endorsed my appointment as the party Leader. Former Presidents Rajapaksa and Chandrika Kumaratunga had been appointed as party patrons while former Prime Ministers Ratnasiri Wickramanayaka and D.M.Jayaratna were appointed as advisors,” President Sirisena said. The President further said, “It’s the responsibility of all of us who love the Sri Lanka Freedom Party to ensure unity within the Party. The SLFP has helped protect and develop our motherland. The Central Committee of the SLFP met on the same evening and ratified my appointment as Chairman. I told Rajapaksa that I would appoint new members to the SLFP Central Committee and other key branches and they agreed,” President Sirisena said. President Sirisena said that he didn’t understand why Rajapaksa maintains that he is still the chairman of the party. “You know that the party leadership can’t be snatched away by force even in a smaller party,” he affirmed. The president said that his enemies are taking revenge against him in a different manner. He pointed out that they were using modern communication tools like Facebook, Twitter, SMS and websites to insult him. He added that they were carrying out a campaign to publish canards, fabrications, misinformation and absolute lies against him. He said that this could be because he didn’t belong to an elite family and didn’t study at prestigious universities like Oxford or Harvard. “I am from a humble farmer family. This is a fight between have and have nots. My arrival is an issue for them.” he underscored. 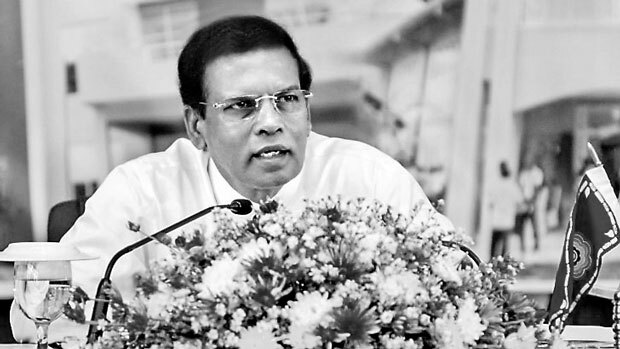 The president said that he didn’t change the SLFP nor leave the party. He said that what he wanted was to rebuild the defeated party. He pointed out that the new political party-the Sri Lanka Podujana Peramuna (SLPP)- formed by Rajapaksas and their clan weren’t clean SLFPers. The president said that he wished to know what the ideology and policy of the people who have formed this new party are? “What is their vision? I can see only nepotism as the policy in the SLPP. I have seen former President Rajapaksa working full time for the new party, participating in its rallies, putting banners and attending press briefings. However, we haven’t fired or driven them away the from the SLFP,” he said. Responding to criticism by the joint opposition that the SLFP is acting according to the fancies of the UNP, President Sirisena inquired why the Yahapalana Government was formed? “Why did Rajapaksa go for a Presidential poll two years prematurely? I made a written request not to do that. If I am a conspirator would I have done that? It is a well known fact that Rajapaksa opted for an early Presidential poll because he couldn’t face the international community, the UNHRC, tackle the impending economic crisis and debts. The Yahapalana Government’s biggest challenge is the repayment of massive commercial loans obtained during the Rajapaksa regime. The debt traps are also affecting the economy badly,” the president said. What would have been the situation if Mahinda Rajapaksa won the Presidential poll in 2015? President Sirisena responding to this question asked how could Sri Lanka have then escaped the wrath of the UNHRC? He pointed out that after this Government rebuilt the image of Sri Lanka and erased the brand tagged to this island as a ‘Pariah State’, the response from the UNHRC, other global agencies and the international community is extremely encouraging and positive. He added that these forces tell him not to get exited and continue with the good work that was commenced. The regaining of the GSP+ and the withdrawal of the ban on exporting fish by the EU are the direct outcomes of this positive image. He said that the Government has been able to build a global community. This Government has been able to dissuade the global community from hauling Sri Lankan leaders from the previous Government before the International Criminal Court. “No one now talks about the electric chair,” he said. All the global financial agencies like the World Bank, the IMF and the ADB and the island’s traditional friends like India, US, UK, Japan, Germany, Russia, Pakistan, France and many other countries are keen on helping Sri Lanka in numerous ways. For instance, the National Economic Committee was established after consultations with the WB, IMF and the ADB. He reminded that the country’s detractors are attempting to feed the minds of the SLFPers with the idea that joining the UNP to form the Yahapalana Government wasn’t good. But the Unity Government has done a lot for the country. The President said that the global community is very glad the Unity Government was formed. However, it’s evident that we SLFPers can’t do everything that want within a Unity Government or in a coalition Government. The President said that what is most important is that the country has achieved much locally and internationally during the past two and half years. Sirimavo Bandaranaike faced the same predicament in 1964 when she was accused of joining with the LSSP to form the Government along with17 SLFP frontliners. The ministers in charge of Agriculture, Lands, Irrigation, Power and the Leader of the House left the Government. The Government was beaten by one vote in Parliament following the debate that had been moved following the Governor’s speech. But the people haven’t forgotten how Mahinda Rajapaksa coaxed a group of UNP members to join the UPFA Government in 2007. The President said that he was summoned from an official tour in China early to sign the UNP – UPFA agreement. He asked how the Unity Government was good then, but when it happened in 2015 it was not good? He went on to state that we must view the concept of a Unity Government in a positive manner as it is a new beginning in Sri Lankan politics. The president said that he can provide a long list of proposals brought before the ‘Yahapalana Government’ which were not carried out. “It was because the SLFP was there. Another advantage of a Unity Government is that two parties can do a balancing act to mitigate the effects of proposals brought by either side that aren’t so good for the economy,” the President said. The main obstacle to eliminate corruption are the politicians who seek power to earn money. The Preferential Voting system has further aggravated this negative trend by opening an opportunity for corrupt individuals to gain political power at local or national level. The root cause for many of the evils in local politics originates from this system. We all must think about the welfare of the country and people. We must not have personal agendas and not make political office a place for business, the president said. The Central Committee of the SLFP will decide in December whether to continue with ruling the country as a Unity Government up till 2020 or depart from this system, so that the two main parties can go their separate ways. It is extremely essential that the Unity Government or the ‘Yahapalana Government’ must woo only the politicians who have no allegations of corruption and crime against them. Even the Indian Government is following a tough policy regarding corrupt politicians. The President said that the North - East issue is something the country will have to address sooner than later. He said that this issue should be handled with extreme care. Priority must be given to ensure there will be no violence in the North-East and the people will get their basic amenities, infrastructure and welfare without a hindrance. The president said that efforts must be taken to discuss power devolution not as an issue for a party to gain a few brownie points, but as a way to further strengthen the facilities and benefits of the people. The main stumbling block in the way of finding a fair solution to the SAITM issue is that it has been irrevocably politicized. The President said that it wasn’t a good practice to conduct Provincial Council polls on a scattered basis. It has opened the doors to many corrupt practices and the wasting of public money. He said that this has to be corrected for the good of the country, democracy and fair play. The President said that the SLFP is ready to face any election with confidence and that the PC polls can be held either at the end of this year or at the beginning of next year in keeping with the time and proposed amendments to the Provincial Council Electoral Act have warranted. It is a fundamental requirement practiced by any democracy for all cabinet ministers to maintain responsibility. “You can criticize, comment or oppose any cabinet proposal within the cabinet, but it is extremely wrong and unacceptable to criticize a cabinet decision after it is approved which then violates the collective responsibility,” he stressed. How could Sirisena elected as President from the Swan Party through which he won the Presidential Elections in 2015, be unanimously elected as the SLFP President.Swan Party was never a part or a coalition party with either the UPFA or SLFP.Walk away from the SLFP Presidency and focus on establishing the promises you promised.You are seen as a self centered selfish fraud sans a backbone who has lost your way. Signal for MR to join with MS for the sake uniting SLFP..